@ Claire: Sorry Claire, but adding adoptions would require the thing to look a bit like a Mobius strip, and I don't have three dimensional paper. Also, I can't believe I forgot about Laitu! *headslap* I knew there was something I was missing. Claire: *pout! * DESIUS gets to be adopted! And I want to be Da's daughter, too! Teal: *trying to fold the paper into a Mobius strip* Peep? The Chimera is Jess Gallagher, now Xerox. Call her Jessica and you die. Mother-Priscella Gallagher. Father-if I ever gave him a first name, I've forgotten it. So, he'll be Dr.Stephen Gallagher. Thanks, Chic! I'll get on that right away. You ARE Andrew's daughter, just not shown to be unless I manage to come up with a better system. @ Laitu: Yes, you do! Sorry! Zander is the grandson of a brother of Luke, Grace, and Alexander Umbra by way of a mysterious and very much dead father. Also: Wow, thanks for the chart, Sarah! Ok, WOW. I can't believe I missed this chart, Sarah! So far it's coming along pretty well! Anyway, I may as well throw my two cents in about Geneologies. Some of this may be redundant with what you already ahve on the chart, sorry. The oldest know Toboz on record is Richard Leslie Toboz, also known as "Pappy". There's no formal record of his birth, although he was granted U.S citizenship after fighting in Vietnam (Apparently it involved sabotaging a frogman experiment or something) which lists his birthdate as being in 1962. However, he claims to be over 90. Any questions about discrepancies in his age quickly degenerate into rants about "Timey-whimy shenanigans" and result in the questioner being bapped with a cane. He eventually settled down with a nice sane girl, Samantha Toboz, and had a kid or two. These days he's mostly content to stay inside the horrible monsterous deathtrap he calls a house, endlessly adding more and more security systems and death machines and tricks and puzzles and exploding lawn gnomes... Claire is doubly-forbidden from walking on his lawn for fear that she'd end up a crater of goo. 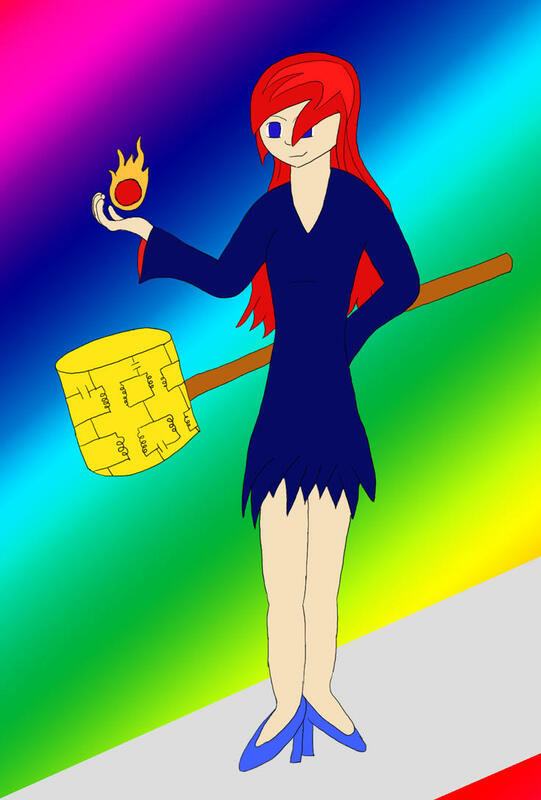 Lady Katharine Drezebel (Call her by her first name, or heaven forbid "Kathy" and she'll trap you in a fanart for eternity). Family apparently died when she was young. Her dad's death made her go mad. Currently pregnant. She'll eventually have three kids, who in order of age are Cleopatra, Cassandra, and Cassius, who take their dad's last name. There's also Mockery, a clone of Sarah Toboz, who is now named Ann Toboz, and is being raised by Richard and Lady Drezebel. She doesn't talk much and likes rocks. Will eventually end up being the big-sisterish figure to Richard and Drezebel's three biological kids. Michael Toboz isn't TECHNICALLY a Toboz, but has more or less adopted Richard and David as his "Uncles" and took their last name based on his origins. He's formally a clone of a Mad teenager named Johnny Noir, whose parents were Cerise Noir and Johnathan Scarlett (who took her last name). More detail on this lineage will probably not come up, since these characters are beyond Tertiary, save for maybe Micahel. Sarcastic Female NPC was born to very nerdy parents who had their names legally changed to "Gruff Bartender NPC" (who does, in fact, run a bar) and "Mouthy Wench NPC". She also has a sister, Chaotic Good NPC, who is 7 years younger than her. Sarcastic gets her case of Clark Kent syndrome from her father, but that's a story for another time. Khan is a frigging tiger. His parents, Rhett and Scarlett, are both tigers who live in a tiger pit at a club in Xyon City designed to cater to Mads, who achieved sentience by eating an unknown chemical in one of the guests they got to devour. Khan has three unnamed younger siblings, as there's not much for two bored tigers to do while living in a pit. Phew! Infodump! Thanks, I'll get on it right away. ....I hate to add to the giant infodumps you're having to deal with, but i figured I'd let you know that Wally does have parents. Walter and Nancy Caine, who aren't related to any of the rest of the characters besides him. Additionally, Lagos the cyborg rabbit is related to Wally and Epsilon Tinker. It's only slightly (something on the order of 20% from each? She's still mostly rabbit, just modifications), but I figured I'd throw that out there. Wait, are people submitting information? Jane Sigma Narbon is the daughter of Helen Beta Narbon and Dave Davenport. Helen Beta Narbon is a clone of (Grandmother) Helen (Alpha) Narbon, otherwise known as "Helen's mom". Before that, the lineages vanish into the mists of time. 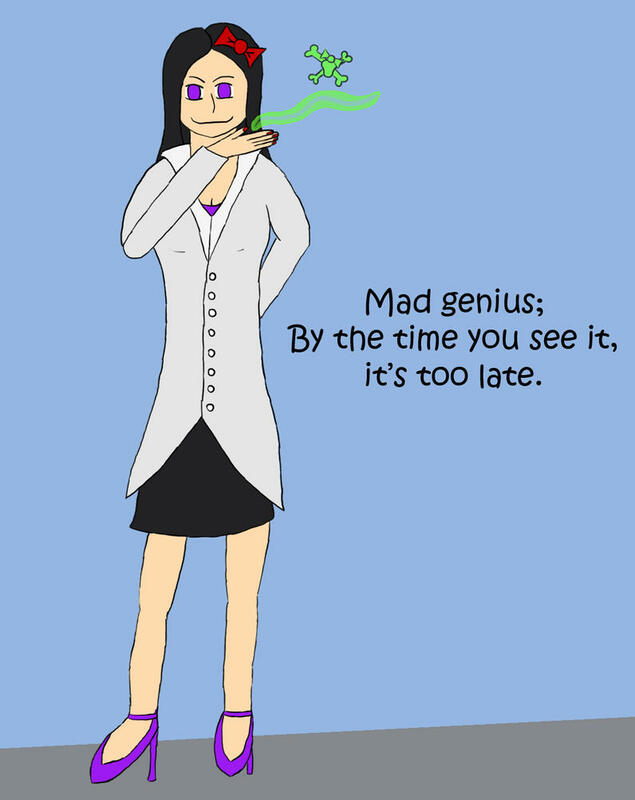 It should be noted that Jane was originally born with a rare condition where the Madness gene was there, but permanently repressed/locked away. SoItBegins' meddling changed all that (she now has focused, controllable Madness), so he should probably be put down as at least a Meddler in Jane's condition. Post subject: Here you go, Demo! Sorry for having you wait. Here's an attempt I did at Demothesis... I don't know who it is, but it's not him. Still, I like the way the coat came out. Well, whoever he is, I like. Well done! Well, it may not look like Demo, but it's a close one to AD on an apparently bad day. ^.^ I like it. And here's your main three. Damien was done entirely in the normal way, all ink, but I decided to experiment with digital hatching/crosshatching, so Sarah's had a bit of that and Axel's a lot more and I have to say it looks good and it's a lot faster than the actual hatching process. You've captured their characters perfectly! I can't say anything more. P.S. I'm glad you like my one. Thanks. Lessee. Dr. Viktors parents are Mama Kitka, and one (?) Viktor, son of a Lady Viktor Ne Sturmovaus, which was how the name got shifted. Fredrics parents were a stag hare named Reginald, and a pet shop rabbit named Mimsy. His avian genetics are a honge podge of golden eagle, dove, and osprey. What chic said about the Viktor Twins- Vladimir is the one in a relationship with minerva and has the triplets. Rasputin might be in a relationship with Ethan Entropy, who is Andrew godfather. Dr. Risk, Andrew Grandfather, 's wife was named Aularia, and was not a mad. Looks fantastic! Also, all this art is fantastic. Ironicaly, Damien looks a bit like Xerox there... heeh. Probably a spiritual similarity. Post subject: This comic brought to you by Blank White Background (TM). - the lazy artist's friend! Ooh, I really like your comic! Here's some sketching I was absent mindedly doing. Check out angry Axel. I drew a thing! I'm posting it because I haven't drawn a thing in a really long time. Freaking school. Anyway, Crash. And me attempting to draw something 'cool'. I'm fond of the eyes, at least, though. I did another arts! I think I like the Crash one better, but they both came out pretty well. Burn doing magic. Inside a rainbow, apparently. Jane Narbon! I spent a lot of time fussing this drawing, but I think it came out ok. It's not as awesome as Revel's stuff, but I still think it's kind of amusing. And one with Jennifer. Because why not. Also, I just like pajamas. Claire? Jane blowing a poisoned kiss was perfect. And Jennifer, hee! Great drawing. 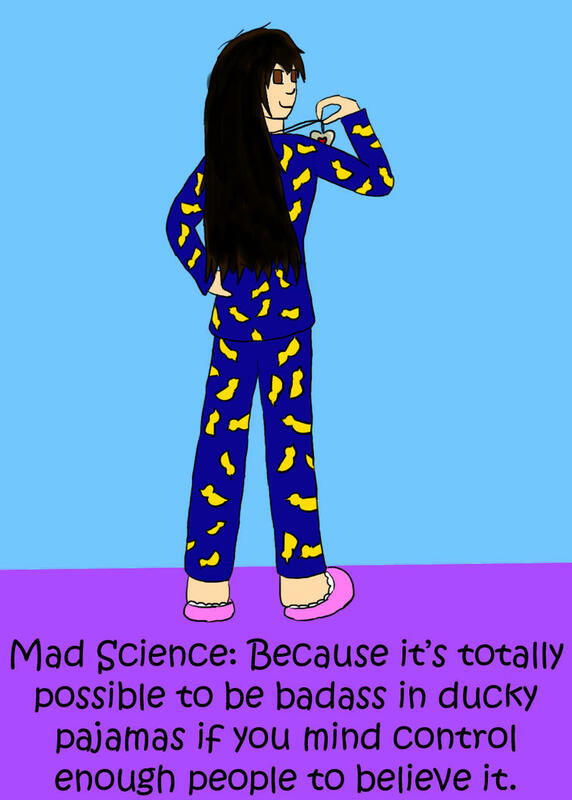 I love the phrase 'badass in ducky pajamas'. Here is Jane Narbon! Sorry it's not coloured, but I was afraid it would mess up the shading. Anyway, enjoy. A while ago I joined a game called "The Process" online. It's an alternate reality game centered around a creepy company named Colefusion. One of the things we did was create products to submit that Colefusion make with their amazing technology. My submission was based off Mad Sci Wars, wtih the drawings of David's robot arm, and what do you know? Mine was accepted. This isn't exactly what David's Arm is like, but it's based off the same design. 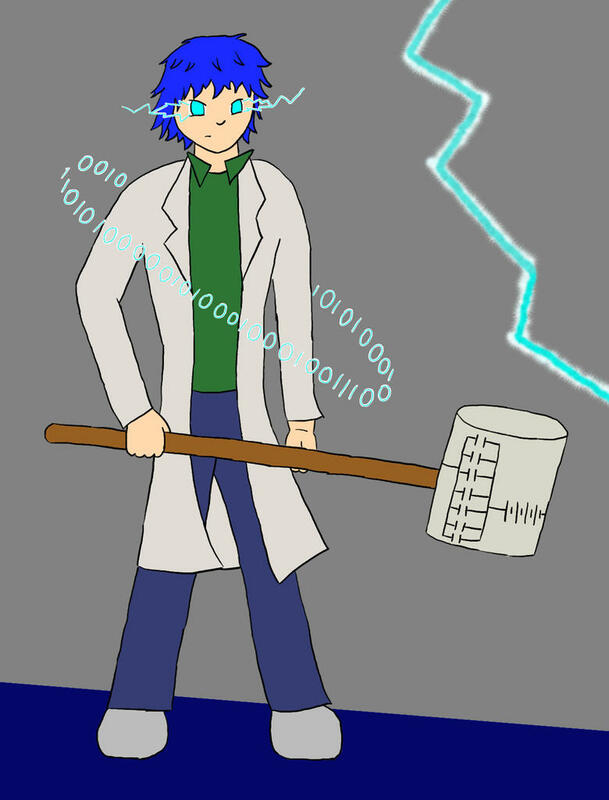 This is something I drew waaaay back when I first started reading MSW. I've been dithering about posting it for the better part of a year. See if you can guess what scene I read immediately before drawing it. I may do a colour version. Like I may finish that other comic, my short story and the second version of the family tree. 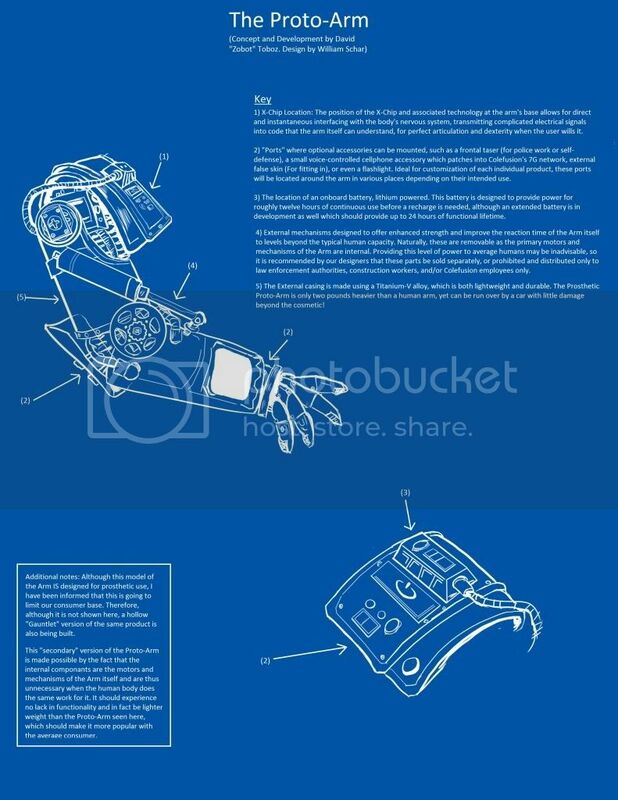 Zobot, congrats on the arm blueprint being accepted! That blueprint is great, you and your friend did a really good job. Hmm, maybe we should keep those plans on file for the next time David needs a replacement arm.